Blood Ties cannot repeat the past, contrary to Jay Gatsby's hopeful assertion. It's less like the '70s than a facsimile of Lumet-style '70s cinema. Blood Ties attempts to repeat the past. Not only is it a remake of Jacques Maillot’s 2008 French thriller Les Liens du Sang, it also evokes the mean streets of 1974 Brooklyn in the seedy style of Serpico and Taxi Driver. Women wear bell-bottom jeans, men sport moustaches and sideburns, storefronts are rundown, and garbage litters the streets. Director Guillaume Canet's gritty realist aesthetic extends from the setting and camerawork to the documentary-like pace, featuring long pauses in dialogue and action. As the ailing pater familias Leon, James Caan brings the credibility of an actor who appeared in '70s movies. The rock and soul soundtrack, some of which is delivered via radio and records within the story world, features the likes of the Velvet Underground, the Rubettes, and Al Wilson, supporting the period feel. Memories of Mila Kunis in That '70s Show add to the film's (postmodern) period credentials. In an era of special effects and CGI, it's refreshing to watch a movie without them. Throughout Blood Ties -- opening in select US theaters 21 March and available on VOD -- muted browns and greys provide a backdrop for a combination lowlife crime story and family melodrama, focused through two brothers. The law-breaking Chris (Clive Owen) has just finished his prison sentence for murder, and the law-enforcing Frank (Billy Crudup) is a New York cop. Older and bulkier than I recall seeing him, and seemingly liberated from the requirement to be beautiful, Owen is captivating and, at least when Caan is not present, he dominates the screen. Emerging from prison in a black leather jacket, with dark hair and tattoos, Chris epitomizes swagger, but in ravaged mode. His face is lined, his prospects constrained. He's also genuinely scary, especially during violent moments that suggest the repression of even greater violence, as well as his self-destructiveness, as when he bangs his head against a post when reprimanded by his manager at a used car dealership, where he cleans the toilets. A complex character, he's both irredeemably callous (shooting a trembling teenager who witnesses a contract killing) and charming (dancing with his daughter). This heady mixture explains how both ex-wife Monica (Marion Cotillard) and new wife Natalie (Kunis) could fall for him. Unlike Chris, Frank is a spectator on life. At his most innocuous, Frank observes others; at his least, he's stalking his former girlfriend (Zoë Saldana). But his brother's reappearance forces Frank towards reluctant participation in the emotions of everyday life. Taking Chris into his home not only leads to conflict with his professional responsibilities, but also exacerbates his weariness with NYPD incompetence and corruption. His personal and professional disillusionment reminds us again of his '70s cinematic precursors, just as the film's impressive car chase pays tribute to The French Connection. But the film does more than competently reuse genre conventions. It lovingly recreates the blue-collar milieu of its intertexts, not just as style, but as substance. This context frames the emotional intensity of the relationship between the two brothers, and between them and their father. During the set-piece family meals, intimacies of masculine melodrama bleed into the crime thriller. Flashbacks to the boys' childhood expose formative moments of bonding and betrayal and leave out heir sister Marie (played as an adult by Lili Taylor). This focus on the brothers excludes what’s going on elsewhere in New York or the US in general. The outside world is mediated by the television screen in their father’s home, occasioning Frank and Chris' conflicting opinions on the news. Every encounter is punctuated by arguments and silences that carry with them the weight of the past. All the characters struggle with the ties that bind them to the past and disrupt the present. Leon's only legacy to his sons is the cautionary tale of his own broken life and tattered narratives about the mother they can barely remember. Chris, in particular, seems driven to repeat the past. The visual similarities between Monica and Natalie suggest that he has picked the same woman twice (as if to underline, Monica predicts that Natalie will mimic her own journey into prostitution). 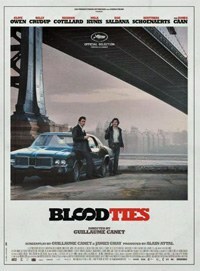 Such bleakness fits with Blood Ties' dual investments in period authenticity and generic accuracy. These make the movie's inauthenticities a bit too noticeable: the soundtrack ranges across the '60s and '70s with some abandon, often motivated more by literalism than historical accuracy (Monica is framed by Lee Moses’ “Bad Girl” and the Velvet Underground accompanies her drug taking; Little Richard’s “Money Is” serves as aural analogue for wads of cash on screen, and so on). And I could not help thinking about what was absent from the soundtrack. The Billboard charts of the mid-'70s were dominated by Elton John, the Osmonds (Donny and Marie), Glen Campbell, and John Denver. Here, none seems to have reached Brooklyn. The brothers in Blood Ties are the kings of cool; their radios don't play 1974’s number one hit, Barbra Streisand’s “The Way We Were.” The soundtrack evokes a period "mood," but it also reveals the film's selective recreation of the past. Blood Ties cannot repeat the past, contrary to Gatsby's hopeful assertion. It's less like the '70s than a facsimile of Lumet-style '70s cinema. Its sentimental emotionalism is shaped by what we see of Chris, Frank, and Leon, past and present. The way they were will always be part of who they are and what they become.